Discussion in 'Card Hunter General Chat' started by Kalin, Sep 2, 2018. !! We are not coding entirely new card functionality for this contest. This means that, for your card to be considered, you must use existing card functionality as "building blocks." This guide is an attempt to at least list what those building blocks are. One of things that makes collectible card games popular is that the cards themselves can modify the rules, or even create new rules. Which is very exciting for players, especially when cards interact with each other. But it also makes the game complicated to implement, since the programmers don't want to have to hardcode every single card. So they try to factor out common features, and have each card say which features it uses and with what settings and modifiers. In Card Hunter the features are called Components and the modifiers are Parameters ("Params"). I do not have access to the actual code, but we do have access to the master card database which is a HUGE spreadsheet (833 rows by 54 columns) that tells the game everything about what a card does and what it looks like. Each card can have up to five components and multiple parameters for each (not sure if there's a limit) and general parameters that apply to the whole card. Fun fact: two cards do not have any components at all! One is available to players, the other one ... well, I suspect the programmers looked at the card text and said "No." I'm going to start with looking at those general parameters, which are mostly things like if/when the card can be played, is it part of a card pool, and does it count towards hand size. The others are things I would have expected to be linked to specific components instead. Testlum, ParodyKnaveBob, gurel2 and 6 others like this. Note that some components just select targets for later components. Most parameters are optional. And I haven't yet researched how exactly it decides when to activate the different triggers. gurel2, Robauke and Sir Veza like this. 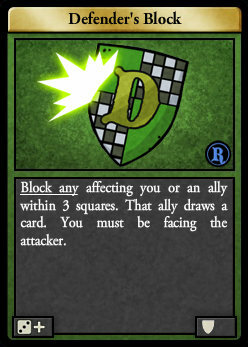 DrawTempComponent, "Create a Block card (Block any, 4+) and put it in target's hand. ", Block, Soldier! Okay, that's everything, you can comment now. ParodyKnaveBob, gurel2, Robauke and 1 other person like this. Wow, very elucidating, yet mind boggling to me. Thanks, @Kalin ! Now for some bad news..
* Starred cards have a separate component to determine which chars/squares are affected. You can still change stuff that appears outside the card text box. Choose two target characters; exchange their positions. Attach to target. 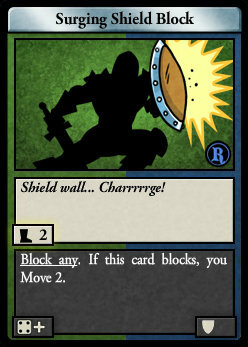 That character may only target the character or group who played this card. Duration 2. Did you know that Elvish does not have a word for "underwear"? ParodyKnaveBob, Sir Veza and Maniafig like this. This is awesome, thanks Kalin. For the record, some of these parameters are less flexible than they might seem at a glance. I don't have a specific example in mind, but I am pretty sure some have hard-coded switches—so they'll do one thing if the parameter is set to X, and a different thing if it's set to Y, and then they'll break if it's set to anything else. ParodyKnaveBob, Sir Veza and SceoMyntan like this. Yeah, Erratic Damage seems to only accept 3 or 6 for its parameter, and you probably shouldn't try to use anything other than a Form with ReplaceDrawComponent ("overload" might work if you wanted someone to draw nothing but malfunctions). Trait. Attach this card to yourself. Duration 2. 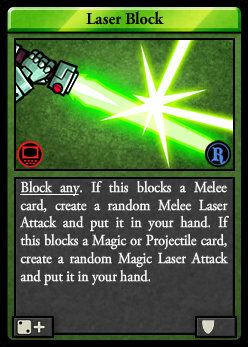 When you play an Electrical card, create and attach a Laser Beacon card to a random occupied square. Whenever you play a Penetrating card add Cantrip to that card and Heal 2 yourself. ParodyKnaveBob and SceoMyntan like this. Now that we've seen what the building blocks are, let's look at specific cards to see how they combine to make a complete card. I'm going to start with Blocks because in a way they're the simplest type of card: there's only one block component, every Block uses it, and they don't use any other components (hybrid Blocks have other components for the non-Block features). On the other hand, this component is the most complicated because it needs lots of parameters to do everything Blocks do in this game. Parameters with "___Type" are generally filters that determine when it triggers, and anything that sounds like an action will only happen if the trigger roll succeeds. So there's our BlockComponent, with three parameters. The first one limits this Block to just Melee attacks, the second lets the defender move themself when successful, and the the third lets the defender move the attacker when successful. Even though there are only three parameters, this manages to be rather complex. First, the Block only triggers on Melee attacks. 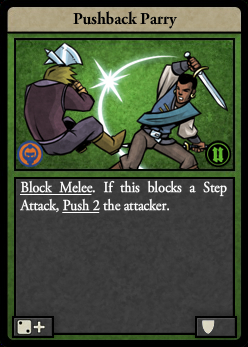 If it blocks an attack with the keyword "Step" then it also lets the defender move the attacker 2. BlockComponent is one of the few components that can see keywords, though many other components can see card type, attack type, and/or damage type. 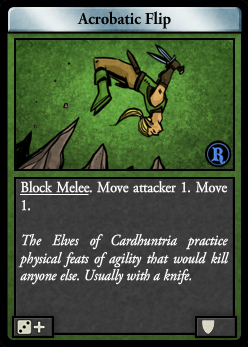 Not as complicated as you might expect: you can block for other allies, within range 3, and the target of the attack draws a card if the block is successful. 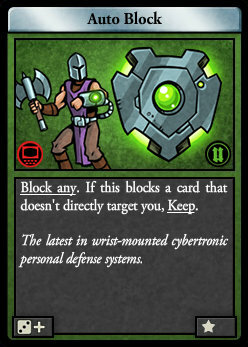 There's the "moveSelf" parameter again, and this card has a second component so it can be played as a Move card. I mentioned above that Blocks are simple because they only need one component. Attack, Assist, and Utility cards need a targeting component to say which characters/squares are affected. The first component says we're targeting a single character (range specified elsewhere, normal LOS rules), second component says to discard 2 cards that have the attack type Magic (discard effects always discard oldest unless they say "random"). 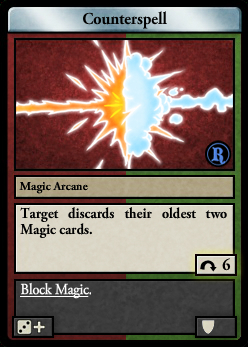 Then finally a Block limited to Magic. Testlum, Flaxative, Sir Veza and 2 others like this.